Characteristics of latrines in central Tanzania and their relation to fly catches. Characteristics of latrines in central Tanzania and their relation to fly catches. PLoS One. 2013 Jul 18;8(7). Irish S, Aiemjoy K, Torondel B, Abdelahi F, Ensink JH. The disposal of human excreta in latrines is an important step in reducing the transmission of diarrhoeal diseases. However, in latrines, flies can access the latrine contents and serve as a mechanical transmitter of diarrhoeal pathogens. Furthermore, the latrine contents can be used as a breeding site for flies, which may further contribute to disease transmission. Latrines do not all produce flies, and there are some which produce only a few, while others can produce thousands. 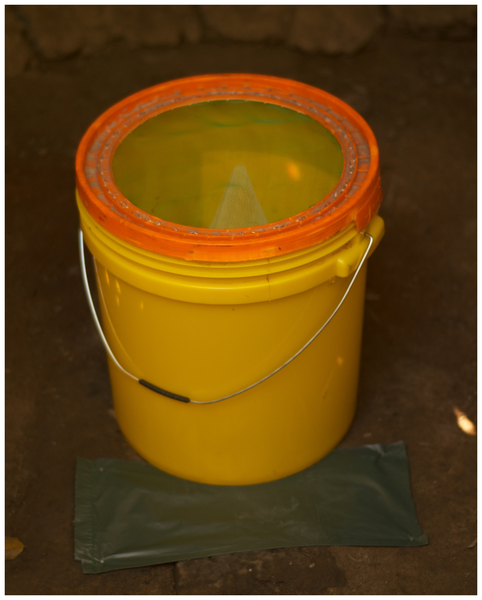 In order to understand the role of the latrine in determining this productivity, a pilot study was conducted, in which fifty latrines were observed in and around Ifakara, Tanzania. The characteristics of the latrine superstructure, use of the latrine, and chemical characteristics of pit latrine contents were compared to the numbers of flies collected in an exit trap placed over the drop hole in the latrine. Absence of a roof was found to have a significant positive association (t=3.17, p=0.003) with the total number of flies collected, and temporary superstructures, particularly as opposed to brick superstructures (z=4.26, p<0.001), and increased total solids in pit latrines (z=2.57, p=0.01) were significantly associated with increased numbers of blowflies leaving the latrine. The number of larvae per gram was significantly associated with the village from which samples were taken, with the largest difference between two villages outside Ifakara (z=2.12, p=0.03). The effect of latrine superstructure (roof, walls) on fly production may indicate that improvements in latrine construction could result in decreases in fly populations in areas where they transmit diarrhoeal pathogens. This entry was posted in Africa, Hygiene Promotion and tagged changing behaviour, flies, latrines, Tanzania, vector control. Bookmark the permalink.